This little piggy went to the market, this little piggy stayed home. And these little piggies hid money in their bellies! In this colorful worksheet, second graders flex their two-digit addition skills to figure out how much money each piggy is holding. Don't miss the bonus question at the end! See the other worksheets in this series for more piggy bank fun. Work on two-digit addition with this piggy bank math worksheet. 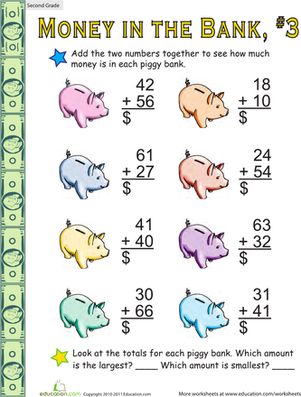 Kids will solve problems to find out how much money is in each bank.